OurEnergyPolicy.org | Could New Gas-Fired Power Plant Technology Revolutionize The Energy Mix? GE recently announced a line of new natural gas turbine models that offer both increased efficiency and flexibility. Traditionally, “Conventional natural-gas power plants are generally either flexible or efficient. That is, some can quickly increase and decrease power output to meet spikes or lulls in electricity demand, while others are able to hum along steadily without using much natural gas but take hours to bring up to speed,” wrote Kevin Bullis of MIT’s Technology Review. Renewable energy sources provide low-emissions power, but are much less predictable or consistent than fossil fuel sources. 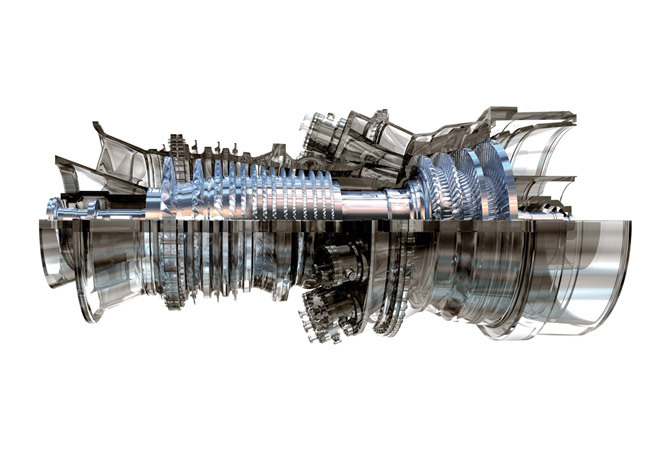 The efficiency and flexibility of GE’s new natural gas turbines could help utilities balance the supply and demand of electricity as they incorporate more renewable energy sources at a low cost. Will technology like this increase the competitiveness of renewable energy? What are other examples of markets for technology that is defined by its adaptability and complementarity to green policies and trends, like increased renewable energy sources on the grid? One Response to Could New Gas-Fired Power Plant Technology Revolutionize The Energy Mix? The technology is nice, but I don’t believe it’s “revolutionary”. It will have some utility for integrating higher levels of renewables into the grid, but I don’t think it’s the most cost-effective approach. I can’t claim to be an expert in turbine design, but my understanding is that what distinguishes the new GE turbines is that they tolerate higher ramp rates than previous models, and suffer less stress from cycling. That’s certainly good. However, they are more expensive, and they can’t do much about the problem of low marginal efficiency for operation at power levels away from their design optimum. Operating below the optimum doesn’t save as much fuel, and operating the above uses more extra fuel than one would naively calculate from just the nominal heat rate. That problem is pretty much inherent to all axial turbines. It isn’t feasible to give them the variable inlet geometry and variable blade pitch that would be needed to deliver a flat efficiency curve over a wide throttling range. The new GE models are essentially baseload power plants that can tolerate cycling. But they’re not well suited for load following or delivery of regulation service. What works better is an approach dubbed “load based regulation” (LBR). It relies on power electronics to deliver a continuously variable power level to a discretionary load — typically water pumping, heat pumping, or electrolysis. The interface to the grid can be designed to mimic an ideal regulated generator in parallel with a constant ohmic load. The load can be varied as needed in a matter of milliseconds rather than minutes. There’s a policy issue here, if I understand it correctly, in that utility regulations in many regions do not allow ancillary services to be provided by variable loads. They have to be associated with real generators. That impacts rate payers, as it guarantees an oversupply of generating assets, most of which will be heavily underutilized. But somebody who knows more about the regulatory environment than I do may want to clarify that situation.